The pain of loving is so intense but I would not trade it for anything. My heart beats with faith and conviction, linked with those I love. There are days when my heart does achingly get caught on thorns, and it becomes pierced and torn. It is then that I open up a deep well from which tears of torn love flows. It is then that I lay bare my emotion and become acutely aware of the depth of love I have for my loved ones and the fragility of the balance in the universe of our happiness. My tears come from the deepest mysterious place within. I cannot explain it, but I am so very grateful to have it within me. When someone we love is in danger, or has a close call, even if it is imagined, our hearts grow larger and stronger to encompass the pain and fold over all the sharp points to protect our loved ones. We reach out to our friends and family with every ounce of our being to bring them closer and into the folds of our arms. And then on days when the world loses someone of great creative genius with whom we have an attachment even though we’ve never met that person, but somehow their influence, their art, has had a strong defining hold on us, then our perception of ourself and our universe shifts. The horizon tilts and our world is rocked. The songs of love and art are no longer playing mindlessly in my head. Instead the art of their melodies becomes something more enduring than even life. 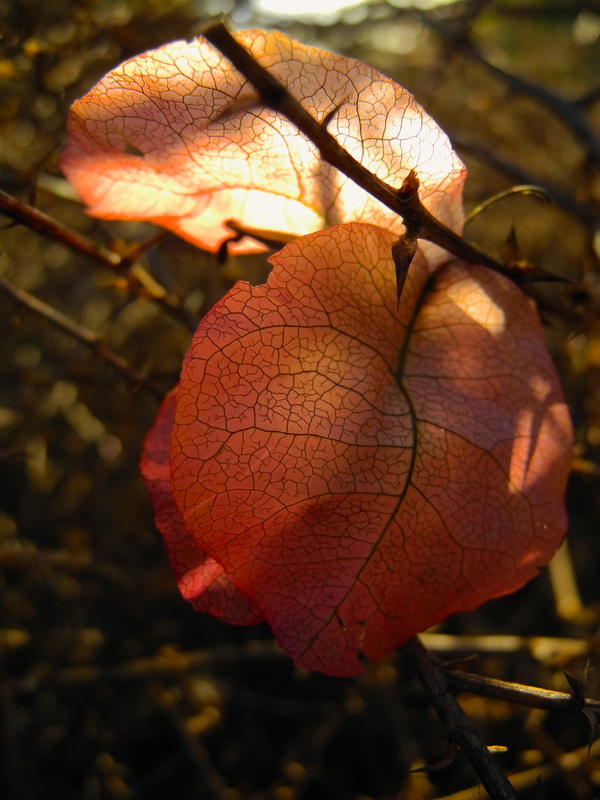 So do not despair bougainvillea leaf, that this tumbleweed has ensnared you. I can clearly see the power in your veins. You bear the marks of great tenderness and in this sunset of your life, the light still illuminates your lovely beauty. This post was written while listening to music from “The Doors” on the day that Ray Manzarek died. Although I never knew him as a person, his music had an incredibly defining influence on me as a child, teenager, and adult. Today my universe shifted. I also had family in Oklahoma, just 15 miles away from where a devastating tornado hit today. They are safe, but I was worried and felt helpless, as they were so far away. Reality hit me twice today and I went a bit asunder.